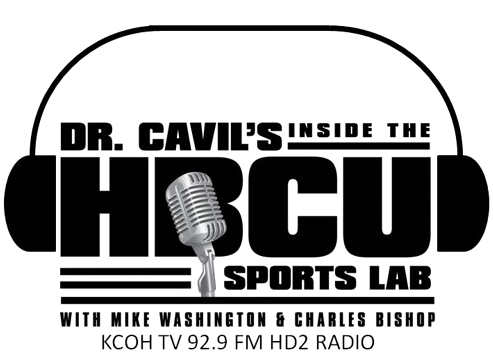 The Black College Legends and Pioneers Committee of the National College Baseball Hall of Fame Foundation is committed to educating the baseball world about the accomplishments of historic and current HBCU programs and their student athletes. Our Committee is also committed to investigating and reporting on the growth and proliferation of black legends and pioneers who struck out on their own to integrate traditionally white institutions as ball players and coaches. One such individual is Dave Baker, the Manhattan, Kansas native, who recently sat down to discuss his long career in baseball. Dave Baker’s story is not unlike many African-American athletes of the 1950s and ‘60s. His story began just like any other athlete regardless of race or color. As a child Baker crossed the tracks to spend hours around Griffith Park on the Kansas State University (K-State) campus in Manhattan, KS. In the ’50s and ‘60s, Dave Baker chased foul balls for the home-standing Wildcats led by another black college baseball pioneer Earl Woods (Tiger’s father). Baker and the other boys returned the foul balls for a nickel and in the process dreamed that someday they would become K-State Wildcat baseball players. When Baker entered the second grade, he was honored to be a bat boy until the sixth grade for the Wildcats. After high school, Baker was offered a chance to sign with the Detroit Tigers, but Jesse Baker, his father, stood fast and insisted that Dave go to college to further his education. At this point a host of legendary coaching and player icons came into Baker’s life which he credits for his development as a leader, coach, and as a man. First on that list was Jack Hartman, head coach of the Coffeyville Community College Red Ravens basketball program. Dave remembered that to go to Coffeyville was an easy choice. His aunt (Lucille Nelson) ran a nursing home not far from campus. Lucille was the owner of the largest black-owned nursing home in Kansas. His aunt owned a house a block of so from the Coffeyville campus. Jack Hartman was his first real coach he had after high school. Baker remembers that Coach Hartman was tough and a disciplinarian, yet “supported you in any way”. The 1962 Red Ravens were the NJCAA National Champions which had 5 All-Americans. Baker highlighted one of Hartman’s basic tenets that Baker has keep his entire life. He quoted Hartman saying “If you are afraid of me and I am helping you to be a better player. I can’t put you out there, if you are more afraid of me. You should be afraid of your opponents”. Hartman left for Southern Illinois and Baker didn’t play much for the next coach, so he went home to work in Manhattan. Baker played that summer where K-State’s Bob Bratcher saw him again and talked Baker into playing one season the spring of 1966 for Bratcher’s K-State Wildcats which by NCAA rules was his final year of NCAA eligibility. 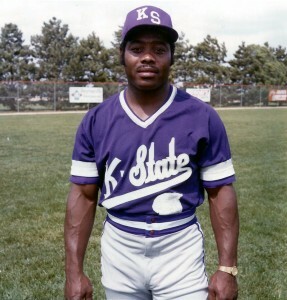 So the following year, Bratcher arranged for Dave to finish his college career with the next legendary coach, Larry Cochelle at Emporia State. Baker was the first graduate assistant ever at Emporia State and went to the Junior College World Series. Coach Cochelle then left for Creighton University. Baker, in 1969, had heard from the new franchise in Kansas City (Royals) that they wanted to sign him. Baker waited and waited to no avail so he finished his master’s degree at Emporia State. After Emporia State, Baker began his coaching career at Seward County Community College in Liberal as an assistant coach in basketball and track of one year. Eddie Sutton hired Baker at Creighton as an assistant basketball coach to Sutton and assistant baseball coach to his former coach Cochelle. When Baker arrived in Omaha, racial unrest overtook the city and its north side was burned to the ground which was located next to Creighton University. The first year Baker worked the entire nation recruiting basketball and that spring worked with Larry Cochelle. After the season Cochelle left Creighton for Los Angelos State. Coach Sutton asked Baker if he wanted to coach basketball or baseball and Baker chose the obvious… and the next was history. Baker became the Bluejays head baseball coach for the next six years (1972-77) becoming America’s first black head baseball coach of a traditionally white collegiate institution. As Dave Baker looked back he said that “Larry and Eddie did so much for me to get me started.” Baker also added that “that Eddie was tremendous and everything that Eddie touched was first class”. Dave Baker reminisced about meeting another African American head coach at a coaches meeting… Miles McAfee, head baseball coach at the College of Saint Mary, California. Miles McAfee guided Saint Mary’s men’s baseball from 1973 to 1980 and was the third African American head baseball coach named at a traditionally white college (The second was Bubba Morton at the University of Washington). 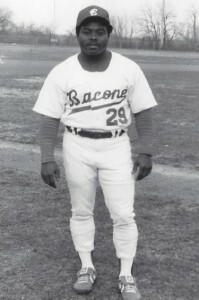 Miles McAfee graduated from the historic Tuskegee University as a college player in 1955 and followed that with a 5-year pro baseball career with the Pittsburgh Pirates. Baker recounted meeting McAfee and that McAfee later represented the likes of MLB stars Chili Davis, Willie McGee, and Rickey Henderson as their sport agent during their major league careers. Dave Baker amassed a respectable NCAA Division I career record of 277-266-1 in twelve years as head coach (six years, 140-107-1 at Creighton 1972-77; six years, 137-159 at Kansas State 1978-83). Dave Baker still remains the sole African-American head baseball coach in Big 6, Big 7, Big 8, and Big-XII history. Afterwards Baker ventured south to NAIA member Bacone College in Muskogee, OK to lead the Warrior baseball program as Head Baseball Coach 1984 – 1995 for twelve seasons. Baker and his wife Sonya remained in Muskogee as Baker began a career in municipal recreation and Sonya continued in the top post at the Connors State College Port campus in Muskogee. Dave and Sonya returned to their native home, Manhattan, Kansas to retire only for a short spell before taking over the Douglass Recreation Center (where he spent many days as a youngster) as Center Director leading its resurgence in the community as a jewel of the black community there in his hometown. Baker remains its director to this day. 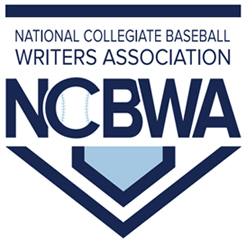 John Winters, PhD, is a member of the Black College Baseball Pioneers and Legends Committee of the National College Baseball Hall of Fame Foundation and an assistant professor for sport and recreation management at Bacone College, Muskogee, Oklahoma. Dr. Winters can be reached at wintersj@bacone.edu. All photos are courtesy of Dave Baker from his personal collection.